It never ceases to amaze me when I’m faced with the reality of how easily I lose sight of the truth – I catch myself stressing out over something silly, even though I know better. And I know I’m not alone in my forgetfulness. So much happens in our lives – so much chaos and distraction – that we often forget the important things we learned long ago. Busy days and demanding obligations have a tendency to put our minds on autopilot, making us more reactive and less mindful every step of the way. Therefore, some of life’s most important lessons need to be reviewed to be remembered. 1. You can’t lift a thousand pounds all at once. Yet you can easily lift one pound a thousand times. Tiny, repeated efforts will get you there. Have you ever felt incredibly overwhelmed? Once upon a time there was a woman who had been lost in the desert for three whole days without water. Just as she was about to collapse, she saw what appeared to be a lake just a few hundred yards in front of her. “Could it be? Or is it just a mirage?” she thought to herself. With the last bit of strength she could muster, she staggered toward the lake and quickly learned that her prayers had been answered: it was no mirage – it was indeed a large, spring-fed lake full of fresh water – more fresh water than she could ever drink in her lifetime. Yet while she was literally dying of thirst, she couldn’t bring herself to drink the water. She simply stood by the water’s edge and stared down at it. And then challenge yourself throughout the day to focus solely on the sip (task, step, etc.) you’re actually taking. Honestly, that’s all life is – small, positive actions that you take moment by moment, and then one day when you look back it all adds up to something worthwhile – something that’s often far better, and different, than what you had imagined when you started. 2. When things aren’t adding up in your life, begin subtracting. Life gets a lot simpler when you clear the clutter that makes it complicated. The most common form of clutter in our lives? And busyness is an illness. Simply focus more on doing less every step of the way. Be mindful of the urge to over-do it. When I’m working, I do just one thing at a time with full focus. And when I catch myself multi-tasking or feeling overwhelmed, I’ll clear everything off my plate and make a list of just one to three key tasks I absolutely need to complete by the end of the day. And yes, sometimes this list is just one thing long, because it helps me focus on what’s truly important and not feel overwhelmed. When I went to the gym two days ago, I had the urge to push myself to my max. I noticed this and instead decided to let that urge go. I did a solid 45-minute workout, but left some fuel in my tank. Yesterday, I went back to the gym and I put in another 45 minutes at a similar pace. This morning, I would have been happy to do the same, but I decided to take a light jog instead. My exercise regimen is sustainable, and that’s why I rarely injure myself or miss a day. When I sit down at a nice restaurant, I don’t try to taste and eat as much as possible. Instead, I leave the table satisfied, but not bloated. I eat less than I used to. This is something I still struggle with at times, because it isn’t easy. It takes practice. The result, however, is that I feel significantly better after each meal and my waistline thanks me. When I travel to a new city, I don’t try to do it all. I choose a few things to do, and I take my time. I then leave the city knowing that there’s plenty to see on my next visit – I leave myself wanting more of a wonderful thing. Let’s do a little less… and make the less we do count for even more. 3. The most powerful weapon against stress is our ability to choose one thought over another. Train your mind to see the good in everything. Being positive and seeing the good does not mean ignoring the negative. Being positive and seeing the good means overcoming the negative. There is a big difference between the two. Of course, that’s easy to say. But how do you actually change your perspective from negative to positive when life gets the best of you? Is this thought true? – This question can change your life. Be still and ask yourself if the thought you’re dealing with is true. Can I be absolutely, 100% certain that it’s true? – This is another opportunity to open your mind and to go deeper into the unknown, to find the answers that live beneath what you think you know. Think about some contrasting possibilities beyond the narrow viewpoint of this one stressful thought. Who would I be, and what would I do differently, if I were not thinking this thought? – Imagine yourself in your situation (or in the presence of that person), without believing the thought. How would your life be different if you didn’t have the ability to even think this stressful thought? How would you feel? What else would you see? Which do you prefer – life with or without the thought? Which feels more peaceful and productive? Just remember that behind every stressful feeling is an untrue thought. Before the thought you weren’t suffering, but after the thought you began to suffer. When you recognize that the thought isn’t true, once again there is no suffering. When you change your thoughts, you gradually change your life. The four questions above are just a starting point for revisiting and reframing the troubling or confusing situations that arise in your daily life. From there you can challenge the stories you’re subconsciously telling yourself and reality-check them with a more objective mindset, which ultimately allows you to make better decisions about everything. So challenge yourself to use this tool… to think differently. Detach yourself from the negative thoughts you’re telling yourself. Go deeper into reality. Don’t just look at the surface. Investigate. Observe without jumping to conclusions. 4. Happiness is letting go of what you assume your life is supposed to be like right now and sincerely embracing it for everything that it is. Holding on can be painful. Holding on can directly contribute to stress, health complications, unhappiness, depressive thoughts, relationship problems, and so on. Yet, as human beings, we cling desperately to almost everything. We don’t like change, so we resist it. We want life to be the way we think it “should” be. We get attached to our fantasies…. even when they hurt us. 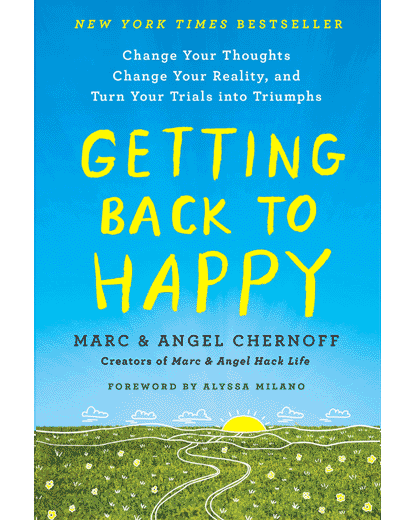 Over the past decade, as Angel and I have gradually worked with hundreds of our course students, coaching clients, and live event attendees, we’ve come to understand that the root cause of most human stress is simply our stubborn propensity to hold on to things. In a nutshell, we hold on tight to the hope that things will go exactly as we imagine, and then we complicate our lives to no end when our imagination doesn’t represent reality. Imagine you’re blindfolded and treading water in the center of a large swimming pool, and you’re struggling desperately to grab the edge of the pool that you think is nearby, but really it’s not – it’s far away. Trying to grab that imaginary edge is stressing you out, and tiring you out, as you splash around aimlessly trying to holding on to something that isn’t there. Bottom line: We cause 99% our own problems by holding on too tightly, to everything. But we can get out of our own way, and find harmony, by letting go. 5. If the grass looks greener on the other side, it might just be life reminding you to water the grass you’re standing on. Rather than focusing on what you don’t have and begrudging those who are “better off” than you, perhaps you should acknowledge that you have lots to be grateful for. Most of us have amazing family members, friends, and other loved ones who love us back. Learn to appreciate what a gift that is. Most of us have good health, which is another gift. Most of us have eyes, with which to enjoy the amazing gifts of sunsets and nature and beauty all around us. Most of us have ears, with which to enjoy music – one of the greatest gifts of them all. You haven’t spent a minute in fear for your life today. Be honest: when was the last time you were appreciative for simply being alive, or going to sleep with a full belly? More specifically, think of all the little things you experience — the smell of a home-cooked meal, hearing your favorite song when it randomly comes on the radio, seeing a marvelous sunset, etc. Look around you today, and water the grass you’re standing on! 6. When people are rude and judgmental to you, smile and choose not to react. Travel the high road. Keep your peace. Do so, and you take all their power away. You will end up extremely disappointed if you expect people will always do for you as you do for them. Not everyone has the same heart as you. Truth be told, being emotionally strong and committed to a cause doesn’t mean you have to stay and fight all the battles and petty arguments that come your way. It means just the opposite – you don’t have to stay and respond to other people’s rude remarks and unnecessary hostility. When you encounter someone with a bad attitude, don’t respond by throwing insults back at them. Keep your dignity and don’t lower yourself to their level. True strength is being bold enough to walk away from the nonsense with your head held high. You need to remember that life is not about justifying yourself – it’s about creating yourself. Your life is yours alone. Others can judge you and try to persuade you to their point of view, but they can’t decide anything for you. They can walk with you if they choose, but not in your shoes. So make sure the path you decide to walk aligns with your own intuition and best judgment, and don’t be scared to walk alone and pave your own path when doing so feels right under your feet. 7. You cannot control exactly what happens in life, but you can control how you respond to it all. In your response is your greatest power. If there’s one thing all six of the previous points have in common, it’s the importance of responding to life’s surprises and challenges more effectively. When you can let go of needless ideals, judgments, and self-pity parties, you give yourself the space required to respond to life’s difficult situations more effectively… and that changes everything. And this applies to everyday difficulties too, not just life’s larger scale catastrophes. For example, when my 2-year-old son, Mac, dumped his dinner plate on the floor last night, I could have gotten upset (“He knows better and he shouldn’t do that!”) and scream (not effective at all), or I could have done exactly what I did and simply let go of that ideal – that judgment – and the resulting tension, and then calmly explain the situation to Mac while helping him clean it up (and yes he actually helped too). My response was indeed the more effective option. Regardless of the situation at hand, when we respond in emotional haste and angst, we only compound our problems. Taking a deep breath, or ten, and responding calmly means we’re going to be able to better handle any difficult situation, whether it’s an emergency or the unexpected loss of a loved one or a 2-year-old’s belligerent misconducts. Of course, all of this is easier said than done. So if you’re struggling to change your response to an unexpected life situation right now, start by evaluating the tension in your body and posture. I bet you can find some kind of tightness. For me, it’s often in my neck, but sometimes it’s in my back and shoulders. Locate the tension in your body right now. Notice what you’re resisting and tensing up against – it might be a situation or person you’re dealing with or avoiding. Relax the tense area of your body – deep breath and a quick stretch often helps. Face the same situation or person, but with a relaxed body and mind. Repeat this practice as often as needed. Face the day with less tension and more presence. Change your mode of response from one of struggle and resistance to one of peace and acceptance. And see how doing so changes your life. Such important lessons, M&A. I do forget them all sometimes. And I know I’ve said this before, but you always seem to drop these articles into my inbox right when I need to read them. It’s #3 in this one that resonates most and literally changed my life. When I first enrolled in your course last year, I was at my wits end with everything I had going on. I felt like my life was nowhere close to the life I had envisioned for myself at 40. But the self-inquiry and journaling strategies that use similar questioning to what you’ve mentioned in #3 gradually gave me the insight into my own negative thinking, and ultimately shifted the way I was responding to life. Since then, about 10 months later, I’ve really had some incredible breakthroughs in both my personal and business lives, just by getting my thoughts better aligned with reality. Number 5 reminds me of one of my favorite excerpts from your book about all the reasons we are wealthier than we realize. Too often I forget to appreciate the little things in my life. I’m always yearning and working for more, more, more. But sometimes enough is enough. Thanks for another must-read post! And thanks for bringing a little extra gratitude into my awareness today. The story about being overwhelmed is so incredibly spot-on! Thank you for putting that into words so creatively. I’m so happy I signed up for your emails. They almost always leave me with positive change in my perspective. Thank you for the enlightenment. #6 YES I often respond with equal aggressiveness and rudeness. This gives me some perspective. It’s a marvelous well written truthful article.. All my love and gratitude to Marc and Angel and team who put this masterpiece together. Any soul who reads it will carry back something I side their head. I usually take a look inside the pencil case of my little students. It’s holding too many pens. They told me , as I could guess it, they wanted an pen to be handy. I explained to them: The good one is in your hand, until another one replaces it. Why are you searching in the case all the time while too many are there? Why do you have to make a choice, when there’s no choice? All of these are very helpful. I believe No. 5 is the one that I will comment upon. By allowing myself to let go of what I think my life should be at any point and time and embracing it as it is. I have much to be thankful! It’s not that I don’t choose to press forward to pursue a dream, it’s understanding that you have to take life live life as it happens as well in the moment. While all of them are incredibly true your very first is the basis of more than one of my mantras. Regardless of your side in politics these are disturbing times. If you might be pro trump, then every post, meme or article may be challenging your beliefs or possibly feel like a threat. The challenges feel overwhelming yet your advice will be the key of our meeting each challenge and doing it PEACEFULLY. I’ve often shared your column on other Social Media sites. And want you to know how much you help myself and others. Thank you!!! This was such a great article to read. I will save this and read it again and again because your words are so helpful. Peace to you both. #4 is probably my biggest battle all my life. And it shows up weighing me down, causing feelings of being overwhelmed, my frustration with stress getting out of control, energy being zapped, clutter, confusion, inability to becoming more organized, being impatient with myself and others, feeling depressed and on a treadmill not getting accomplished the things I would like to, clouding the beauty of the precious moments in front of me. Five and 1/2 years ago I found myself 46 years old with a 20-month-old and not much but our clothes and minor necessities..no job or income, no car, no health insurance and homeless since we left an unhunhappy, dysfunctional home. Family couldn’t help although they tried a little. As of today, I have a f/t civil service/union job with benefits, a car and a smart & beautiful 7 yr old. We rent a duplex with 2 baths!! During my crawl back out of the hole, I also weeded out toxic relationships. Now that I feel good about what I’ve provided, I feel alone. This article cheered me up and made me realize that I get to paint a new canvas. It’s hard but I’m resetting my life once again. Thank you for your emails!! Hi, I’m still bummed out about the Falcons. Your email is actually helping me with the disappointment. Obviously it’s really not that serious, & they played an awesome game, but I feel so bad for some reason. However, there are so many bigger things to be concerned with! Your email brightened our day & now we’ve got to rise up…again. Thanks. Too often I have scrolled right past your emails, but I opened this one today. It has been a great reminder. I was actually just talking with someone a little while before reading your message and in other words it was the exact thing I was telling them about struggling against drowning and realizing if you relax you find you can float. I will revisit this as a reminder. There are so many emails that come in a day and everybody selling or want you to address them, so sometimes that becomes overwhelming and you end up saying forget it all. thank you for your passion. I struggle with god, what I have been taught as opposed to what I have learned through learning myself and how to share that place with those around me and still be me with what has been learned of me without frustrations of others and yet be around them and let them be. All lines are great and helpful. Thank you for your emails and insight. “If the grass looks greener on the other side, water the grass you’re standing on.” I didn’t get something that I worked hard for and that I wanted very badly. I need to learn to to be grateful for what I have right now–it’s a lot. I love it. It put a smile on my face about forgetting to water my own grass!!! Thank you! Always need the small sips you send us 🙂 God bless! I just love you guys. You so often hit the nail on the head for me. These days I have been reading from your 1,00 Little Things book each morning then writing in my gratitude list. I have had a difficult time letting go and being present in my new life since my very unexpected separation and divorce 3 years ago after 25 years of marriage. My life turned upside down and now I am lving a very different life than I was used to or “expected”. I found you two early on and have now shared your readings with many people. I think no matter where one is in life you always have valuable tid bits to pass on and help us in our personal growth. I thank you from the bottom of my heart and so want you to know you are making a difference. Blessings to both of you and your lovely Mac. All of these resonate with me but 2 in particular. I was reading this this morning as I got ready for another day of decluttering my house in order to sell it. It seems an insurmountable job to pack up let alone try and sort out 16 years of life which we have collected since we moved in after renovating, adding child no 3, and general growing up . I know I just have to take one spot, one space, one box , one room at a time. And mostly on my own . I have lived through “letting go my assumed life” when my husband left 5 years ago to stay living overseas where he traveled for work and then marry someone else . At the time , my happily forever after plans /visions were shattered and it seemed like a big hole in my future was dumped in my way. But then I realised that I had already survived his ‘leaving’ as he had been working away from home for 11 years and I was the one who kept the family going and together , organised the household bills repairs etc , shared the children’s milestones and successes with them in person and that I could easily go on without him. 5 years down the way I realise that I was happily busy but not entirely happy with life, I was always waiting for him – to call, come home , or make decisions I would ultimately make myself anyway. I got on with my life with my children , and we have not stood still . I am in control of my finances , my work, my life , and now taking next step into my new house and home ( on my terms and not his)!! And while I have not yet met another someone special I am watering the grass I’m in until I stand still long enough and am ready for us to notice each other. Thank you. When I am able in the near future I will be signing up for your course; these free newsletters you send out alone have already opened my eyes and done me a world of good. I am definitely calmer already, and working my way back to happy – you’re a wonderful and very insightful duo, please keep it up ! #6… When people are rude and judgmental to you, smile and choose not to react. Travel the high road. Keep your peace. Do so, and you take all their power away. It’s happening to me right now, and that line helps. Thank you for such an inspiring and motivating article. I have recently subscribed to your articles via email and they always cheer me up. Though I could relate to all the points in this one, #3 is closest to my situation. Thanks once again. At times I feel so overwhelmed, I just want to run away from it all. I end up screaming at my child, hating my life. Am stuck in my job for the last ten years and have not progressed. I love my husband but cant be intimate with him. I resent him for paying so much child maintenance for his other child that he cant do much for us. I see my in-laws travel the world but cant send my daughter gifts for Christmas or her birthday. I’m mad that my parents are dead and my in-laws are still living. I see other people living my dreams. I smile but inside I’m so utterly empty. thank you for reminding me that my life is just as beautiful as it is. This post said it all and it is an eye opener for me! keep them coming! 4. Happiness is letting go of what you assume your life is supposed to be like right now and sincerely embracing it for everything that it is. .. I had a major depressive episode last year, and I am still not fully recovered. I don’t work fulltime yet and it annoys me more than anything right now. I am not 100% OK and I battle to deal with that. I love point 5, water the grass on your own side. Such a good piece of advice. Possibly my new favourite saying! I thoroughly enjoyed this. It came at just the right time in my life. I’ve been feeling down lately not happy with things in my life and I’ve been struggling to pick myself up. Number 4 really struck a cord with me. Things have changed in my life since I got married almost 4 years ago and I think I’m still holding on to my past. I still wish things would be the same. But they cant… life moves forward. And I assumed andhad expectations of how my life should be and when they are not, I mourn the past, I crave my fantasy life and in that way I haven’t allowed myself to be happy in the present. To accept. I wish I could control everything so that I can be prepared to deal with whatever situation I find myself in. it’s my way of dealing with stress. If I can predict the outcome, I can emotionally prepare myself for the situation. Often numbing myself to it. This has helped a lot. Thanks. Love the story about the desert and the water. One small step each day leads to great things in the future. When you feel overwhelmed, just take it one step at a time, as much as that sounds cliché. Happy to be a part of the community. Point #5 resonates with me. I am letting a bully continue affect me even though I don’t work with him any more and I have left the organization which failed to address the issue. I am reliving the experience in my head after a huge review into the organization became public. Part of me wants to help the organization improve the response process to workplace bullying & harassment and the other half shouldn’t give a stuff. I wonder which one will win out. I am hopeful that I found your website. I am looking forward to the daily emails. I have been in isolation for 3 years. I go grocery shopping. I have lost my Zest. Medically they say I have MDD, PTSD and severe anxiety. Fear consumes me. I am not resonating on that or thinking of it in a negative way. I do not know how to start life again or if I even want to. It sounds silly but I feel.peace in my isolation. It is a very long story. I wanted to say thank you to both of you and to God, the Universe, Jesus, vibrations, spirituality for your blog to pass my direction. Peace be with you, Nameste…. I have made my body physically stop working due to chronic stress and my brain will not relax. I’ve read your brain can get stuck in fight or flight mode. I’ve done it. And this read has given me some good ideas to calm down. I’d like number five made up as a sign to go in my shed! Great post guys. What a great reminder. I’ve been trying so much more to be present with my kids and take a breath before reacting to situations. It makes things a whole lot better. Wonderful tips thank you. Marc and Angel …just so you know that, you people are gems…!! !